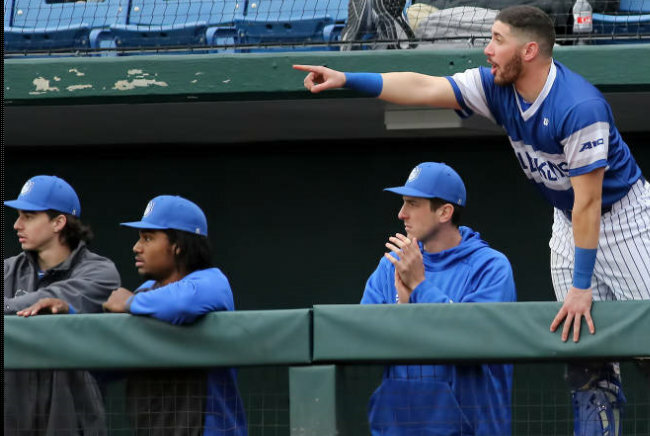 A day after Braxton Stowe watched from the sidelines as his Saint Louis University Men’s Baseball teammates opened their season with a win over Miami (OH) 9 – 1, the two teams would meet again in a double header that the teams would each pick up a win. Miami nabbed Game One by the score of 3 - 2, and Saint Louis won the Second Game 10 - 3. Jackson Wark took the loss despite giving up only one earned run in 4.1 innings. He gave up six hits and struck out six batters. Junior Charlie Sheehan took over on the mound in the fifth inning, and he allowed Saint Louis to stay in it. Sheehan pitched 3.2 innings of one hit ball and added two strikeouts to his line. Luke Matheny made his Saint Louis spring debut as the starting pitcher for Saint Louis. He went 3.1 innings, giving up two runs on five hits. Matheny struck out four batters on the afternoon. Saint Louis jumped out to an early 1-0 lead in the first inning of game two when Ryan Calhoun hit an RBI single. Shane Benes and Ben Livorsi both tacked on RBIs in the third inning, putting the team up 3-0. Miami (OH) gradually came back throughout the game, scoring two in the fourth inning and one in the eighth. Saint Louis used three doubles to help take the lead back in the bottom of the eighth inning. Corrigan Bartlett and Cole Dubet both drove in two in the inning, and Jake Garella drove in one, giving Saint Louis a 10-3 lead heading into the ninth inning. Ryan Lefner finished out the game in the top of the ninth, and Saint Louis took game three of the series, 10-3.